Now, we all know about the cringeworthy showing by the Los Angeles Rams in the Super Bowl. Quarterback Jared Goff could pretty much do nothing against the New England Patriots. Now, it seems like the Rams don’t really know when they’ll extend Goff. Staying with the Rams, Liz and Matt dive into the fickle world of mock drafts, where some actually have the Rams selecting Alabama’s Josh Jacobs at the end of the first round of the 2019 NFL Draft (8:00). Uh, Todd Gurley, anyone? We’re all familiar with the soap opera that occurred late in the season in regards to his injury. Could the Rams try to solidify the position with a draft pick? 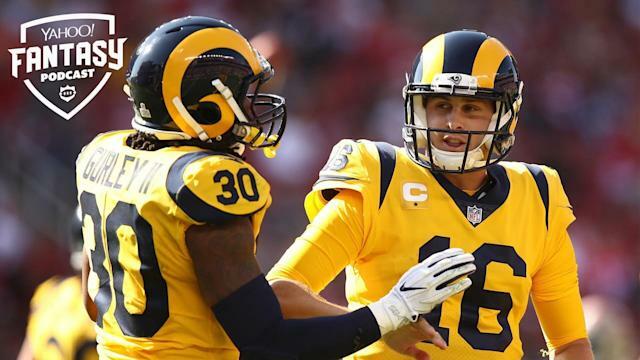 With all this talk about Goff and Gurley, are the Rams set to undergo a makeover sooner than we expect? Liz and Matt stay on the west coast, where the 49ers have a ton of backfield options, but who do we trust in fantasy (16:30)? Will it be Jerick McKinnon, returned from injury? Or how about Matt Breida and Raheem Mostert? Or maybe Tevin Coleman will be the one to lead this group? Elsewhere in the NFL, Jordan Howard was traded to the Philadelphia Eagles, but Matt & Liz didn't know that at the time the episode was recorded. So instead, listen to their incredibly prescient takes on the former Chicago running back (20:00). Later, they hop on board the Chris Godwin hype train after Adam Humphries signed with the Titans (30:40). Speaking of hype, the Saints signed the resurgent Jared Cook which opens up a larger conversation Cook's value in the frustratingly shallow tight end market (25:55). A listener calls in asking if the Cleveland Browns have so much talent fantasy owners should be worried (36:00). Don’t forget to leave a voicemail on a future episode of Liz and Matt’s Help Line by calling (888) 85-YAHOO or (888) 859-2466.